From minor challenges to major crises, stress is part of life. And while you can't always control your circumstances, you can control how you respond to them. When stress becomes overwhelming, or it's chronic, it can take a toll on your well-being. That's why it's important to have effective stress relievers that can calm your mind and your body. There isn't a one-size-fits-all option when it comes to stress relief, however. And what works for you at home might not be an option when you're at work or in the community (dancing around your living room might be helpful but dancing in the grocery might not be). So it's important to have a variety of stress relief tools at your disposal. Then, you'll be able to pick a strategy that works best for your current circumstances. Whether you're about to be interviewed for a job or you're feeling overwhelmed by your child's behavior at the playground, it's important to have some stress reduction tools that can lower your stress right now. Take very little practice to master. Guided imagery is like taking a short vacation in your mind. It can involve imaging yourself being in your "happy place," such as picturing yourself sitting on a beach, listening to the waves, smelling the ocean, and feeling the warm sand underneath you. Guided imagery can be done with a recording where you listen to someone walk you through a peaceful scene. Or, once you know how to do it yourself, you can practice guided imagery on your own. Simply close your eyes for a minute and walk yourself through a peaceful scene. Think about all the sensory experiences you'd engage in and allow yourself to feel as though you're really there. After a few minutes, open your eyes and return to the present moment. Meditation brings short-term stress relief as well as lasting stress management benefits. There are many different forms of meditation to try–each one is unique and brings its own appeal. You might develop a mantra that you repeat in your mind as you take slow deep breaths. Or, you might take a few minutes to practice mindfulness, which involves being in the moment. Simply pay attention to what you see, hear, taste, touch and smell. When you're focused on the here-and-now, you won't be able to ruminate about something that already happened and you can't worry about something in the future. Meditation and mindfulness take practice, but it can make a big difference in your overall stress level. Progressive muscle relaxation involves relaxing all the muscles in your body, group by group.To practice, you can start with a few deep breaths. Then, practice tightening and relaxing each muscle group, starting with your forehead and moving down to your toes. With practice, you'll learn to recognize tension and tightness in your muscles and you'll be able to relax more easily. Each time you practice, however, you should experience a feeling of relaxation sweeping through your body. Just focusing on your breath or changing the way you breathe can make a big difference to your overall stress level. Breathing techniques can calm your body and your brain in just a few minutes. The best news is, no one around you will even know you're doing them. So whether you're in a stressful meeting or you're sitting in a crowded theater, breathing exercises could be key to reducing your stress. Breathe in through your nose and watch your belly fill with air. Count slowly to three as you inhale. Hold for one second and then slowly breathe out through your nose as you count to three again. Breathe in through your nose and imagine that you're inhaling peaceful, calm air. Imagine that air spreading throughout your body. As you exhale, imagine that you're breathing out stress and tension. Exercise is a fantastic stress reliever that can work in minutes. Taking a walk allows you to enjoy a change of scenery, which can get you into a different frame of mind, and brings the benefits of exercise as well. So whether you just need to take a stroll around the office to get a break from a frustrating task or you decide to go for a long walk in the park after work, walking is a simple but effective way to rejuvenate your mind and body. In the privacy of your own home, there are many stress relief strategies that can help you relax fast. So whether you've had a tough day at work or you're stressed about how much you have to do, these strategies can give you some immediate relief from your stress. Physical touch can do a lot to relieve your stress. Hugging a loved one can be especially beneficial. When you hug someone, oxytocin (also known as the cuddle hormone) is released. Oyxtocin is associated with higher levels of happiness and lower levels of stress. Oxytocin also causes a reduction in blood pressure. It reduces the stress hormone norepinephrine and can produce a sense of relaxation. So don't be afraid to ask a loved one for a hug if you need it. It's good for both of you and it can be one of the simplest forms of stress relief available. Aromatherapy has real benefits for stress relief—it can help you to feel energized, more relaxed, or more present in the moment. Emerging research suggests certain scents can alter brain wave activity and decrease stress hormones in the body. So whether you enjoy candles, diffusers, or body products, consider incorporating some aromatherapy into your day. Getting in touch with your creative side may have been easy for you during childhood, but if you’ve lost touch with your penchant for artwork, it’s not too late to pick it up again. If you aren't in to drawing or painting, consider coloring in a coloring book. Adult coloring books have risen in popularity and for good reason—coloring can be a great stress reliever. Research consistently shows that coloring can have a meditative effect. One study found that anxiety levels decline in people who were coloring complex geometric patterns, making it a perfect outlet for stress reduction. So it's important to create a lifestyle that will help you ward off stress and deal with challenges in a healthy way. A poor diet can bring greater reactivity toward stress. Emotional eating and reaching for high-fat, high-sugar foods can provide a temporary sense of relief that adds to your long-term stress. Refined carbs, like cookies and potato chips, can cause a spike in blood sugar. When your blood sugar crashes, you might experience more stress and anxiety. Consuming a healthy diet can help you combat stress over the long haul. Foods like eggs, avocado, and walnuts support mood regulation and energy balance. Leisure activities can be a wonderful way to relieve stress. Yet, many people feel as though their lives are too busy for hobbies, games, or extra fun. But building time for leisure into your schedule could be key to helping you feel your best. And when you feel better, you'll perform better, which means leisure time may make your work time more efficient. Whether you find joy in caring for a garden or you like make quilts, hobbies and leisure are key to living your best life. The way you talk to yourself matters. Harsh self-criticism, self-doubt, and catastrophic predictions aren't helpful. If you're constantly thinking things like, "I don't have time for this," and "I can't stand this," you'll tress yourself out. It's important to learn to talk to yourself in a more realistic, compassionate manner. When you call yourself names or doubt your ability to succeed, reply with a kinder inner dialogue. Positive self-talk can help you develop a healthier outlook. And an optimistic and compassionate conversation can help you manage your emotions and take positive action. Yoga combines physical movement, meditation, light exercise, and controlled breathing—all of which provide excellent stress relief. And while you're likely to reap immediate benefits from a single yoga session, you're likely to receive long-term benefits if you incorporate it into your life. Yoga offers a variety of physical, psychological, and spiritual benefits. To get started, you might take a class, enroll in an online program, or use an app to help you begin practicing. Gratitude helps you recognize all the things you have to be thankful for. Whether you're grateful for a sunny day or thankful that you arrived at work safely, think about all the good things you have in life. Gratitude also reminds you of all of the resources you have to cope with stress, which can be quite empowering. Studies also show grateful people enjoy better mental health, lower stress, and a better quality of life. So whether you decide to make it a habit to identify what you're grateful for as you sit around the dinner table or you decide to write down three things you're grateful for in a gratitude journal every day, make gratitude a regular habit. Physical activity is key to managing stress and improving mental health. And the best news is, there are many different kinds of activities that can reduce your stress. Join a gym, take a class, or exercise outside. Keep in mind that there are many different ways to get more physical activity in your day too. Walking, strength training, kayaking, hiking, and spin class are just a few different examples of ways you can get stress relief. Most stress relievers focus on changing your emotions. But sometimes, you won't necessarily get relief until you change the environment. This is referred to as problem-focused coping (as opposed to emotion-focused coping). Problem-focused coping involves taking steps to remove the stressor from your life (as opposed to changing how you feel about the stressor). If you're trying to squeeze 20 hours worth of work into 16 hours, you're going to feel stressed. Reducing your workload could be key to helping you get through the day feeling better. Honing your time management skills can allow you to minimize the stressors that you experience, and better manage the ones you can't avoid. When you are able to complete everything on your "to do" list without the stress of rushing or forgetting, your whole life feels easier. Having supportive people in your life is key to stress management. If you lack emotional support and friendship, it's important to get it. That may mean reaching out to your existing network. Perhaps confiding in a family member or distant friend can help you become closer and it may give you the social support you need. You may also need to expand your network. Join an organization, attend a support group, or get professional help if you lack supportive people in your life. Sometimes, the best way to reduce your stress is to cut something out of your life. Get rid of the things that are adding to your stress so you can experience more peace. Watching the news, being constantly connected to your digital devices, drinking alcohol, and consuming too much caffeine are just a few of the things that may add more stress to your life. Making some changes to your daily habits could be instrumental in helping you feel better. 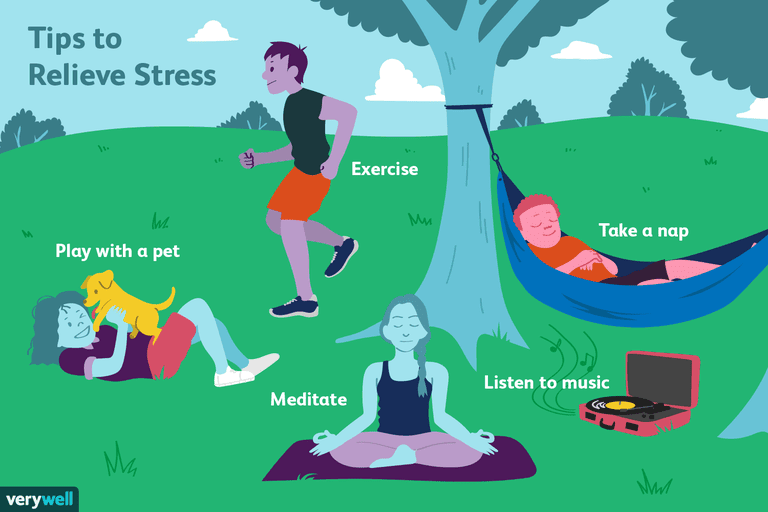 Finding the best stress relief strategies may take some experimenting. Some strategies may take practice too. But it's important to keep looking for the tools that will help you manage life's inevitable ups and downs in a healthy way. Keeping stress at a manageable level is important for your overall well-being. Nakata A, Takahashi M, Irie M, Ray T, Swanson NG. Job Satisfaction, Common Cold, and Sickness Absence among White-collar Employees: A Cross-sectional Survey. Industrial Health, September 2010. Armstrong K, Dixon S, May S, Patricolo GE. Anxiety reduction in patients undergoing cardiac catheterization following massage and guided imagery. Complementary Therapies in Clinical Practice. 2014;20(4):334-338. Wilson C. Neurons linking breathing and stress found. New Scientist. 2017;234(3120):16. Lee M-K, Lim S, Song J-A, Kim M-E, Hur M-H. The effects of aromatherapy essential oil inhalation on stress, sleep quality and immunity in healthy adults: Randomized controlled trial. European Journal of Integrative Medicine. 2017;12:79-86. Light KC, Grewen KM, Amico JA. More frequent partner hugs and higher oxytocin levels are linked to lower blood pressure and heart rate in premenopausal women. Biological Psychology. 2005;69(1):5-21.